My work bares the imprint of growing up immersed in the artist culture of Cape Ann Massachusetts. Picture a nine year old striding to catch up to a pack of adults through, for her, shoulder high meadow grass; going through the summer light to some place unknown to paint, with adults. That was the first group workshop, one of many to follow over the next many decades. I have always been an artist. Painting is an avenue in which I work to translate my experience to others. Color, composition and shape are the elements of the language I 'speak' ; instinctive, deliberate and real. Rhode Island School of Design and a year in Italy were my formal art training. Then, living over a decade in Europe, exploring a buffet of museum collections, my artistic sense cemented: a plate of Sargent, a cup of German Expressionism, a gallon of energy and brushstroke. Now, based out of Tidal Edge Gallery in Rockport, I work to be a new link in the Cape Ann art tradition, to evolve and progress in presenting the landscapes of my daily life in a unique and inspiring style. 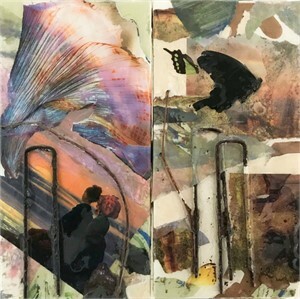 Heidi Caswell Zander My work bares the imprint of growing up immersed in the artist culture of Cape Ann Massachusetts. Picture a nine year old striding to catch up to a pack of adults through, for her, shoulder high meadow grass; going through the summer light to some place unknown to paint, with adults. That was the first group workshop, one of many to follow over the next many decades. I have always been an artist. Painting is an avenue in which I work to translate my experience to others. Color, composition and shape are the elements of the language I 'speak' ; instinctive, deliberate and real. Rhode Island School of Design and a year in Italy were my formal art training. Then, living over a decade in Europe, exploring a buffet of museum collections, my artistic sense cemented: a plate of Sargent, a cup of German Expressionism, a gallon of energy and brushstroke. Now, based out of Tidal Edge Gallery in Rockport, I work to be a new link in the Cape Ann art tradition, to evolve and progress in presenting the landscapes of my daily life in a unique and inspiring style.